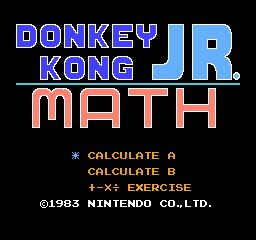 The Donkey Kong family teaches math in Donkey Kong Jr. Math, the only NES game to bear Nintendo's "Education Series" label. It was one of the 19 NES titles present in Animal Crossing, and was later released on Virtual Console. Most of the game's CHR ROM was directly copied from Donkey Kong Jr. As a result, some of the original graphics go unused. Mario! Sadly, he doesn't actually appear in this game. Junior with his hands up, originally used when catching his father. The fruits, also not found anywhere. Nitpickers flying downward. Only their horizontal sprites are actually used. The Sparks from Stage 3. This page was last modified on 10 July 2017, at 20:15.